The University of Lethbridge Alumni Association is pleased to present the 2003 Distinguished Alumnus of the Year Award to Leroy Little Bear. Mr. Little Bear's significant contributions to First Nations education, leadership, and cultural advancement make him an extremely worthy recipient of this award. Leroy Little Bear was born and raised on the Blood Indian Reserve (Kainai First Nation), approximately 70 km west of Lethbridge, Alberta. 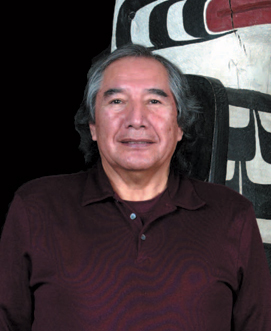 One of the first Native students to complete a program of study at the University of Lethbridge, Little Bear graduated with a Bachelor of Arts Degree in 1971. He continued his education at the College of Law, University of Utah, in Salt Lake City, completing a Juris Doctor Degree in 1975. Following his graduation, Little Bear returned to his alma mater as a founding member of Canada's first Native American Studies Department. He remained at the University of Lethbridge as a researcher, faculty member and department chair until his official retirement in 1997. In recent years Little Bear has continued his influential work as an advocate for First Nations education. From January 1998 to June 1999 he served as Director of the Harvard University Native American Program. Upon his return to Canada, he was instrumental in the creation of a Bachelor of Management in First Nations Governance at the University of Lethbridge - the only program of its kind in the country. After a lifetime of educational service, Little Bear remains a dedicated and dynamic teacher and mentor to students and faculty at the University of Lethbridge. He continues to pursue new research interests including North American Indian science and Western physics, and the exploration of Blackfoot knowledge through songs, stories and landscape. In the spring of 2003, Little Bear was awarded the prestigious National Aboriginal Achievement Award for Education, the highest honour bestowed by Canada's First Nations community. While his educational achievements are remarkable, Little Bear's contribution to the First Nations community extends well beyond the classroom. He has served as a consultant to local and national organizations including the Blood Tribe, Indian Association of Alberta and the Assembly of First Nations of Canada. His notable reputation has also earned him a place on numerous government commissions and boards including the Task Force on the Criminal Justice and Its Impact on the Indian and Métis Peoples of Alberta (1990-91). Little Bear's legal advice is widely sought on such significant issues as land claims, treaties, and hunting and fishing rights. Mr. Little Bear is the co-author of several books on self-government and Aboriginal rights, including "Pathways to Self Determination", "Quest For Justice", and "Governments in Conflict". His credits also include a variety of influential articles such as, "A concept of Native Title", which was cited in a Canadian Supreme Court decision. Lola Major, local teacher and U of L alumna, says Leroy's unparalleled drive to see others succeed, and his ability to connect people of all cultures, make him an outstanding candidate for Alumnus of the Year. "Leroy's reputation as a scholar, author, consultant and University of Lethbridge builder is without equal in his quest for excellence, understanding and equality for Aboriginal peoples. Modest, caring and valued, Leroy Little Bear is a truly remarkable person, well-deserving of this award." The University of Lethbridge Alumni Association is proud to recognize the leadership and achievements of Leroy Little Bear by awarding him the Fall 2003 Alumnus of the Year award.